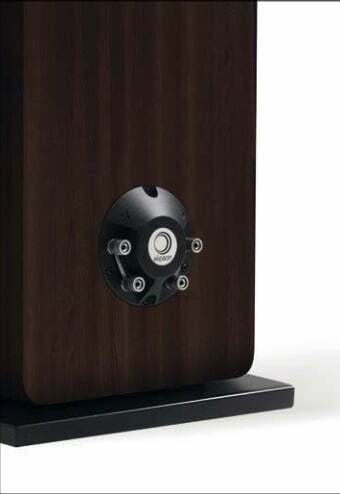 But the wider market has always been a little shy of curvy loudspeakers so the Prestige Facet range consists of box loudspeakers and the 24F is the largest of these. It’s certainly substantial at over 26 kilos and a 1137mm height – nearly four feet in old money. In many respects it looks like a classic ‘mug’s eyeful’ loudspeaker; with its multiple large drive units in funky surrounds on a shiny baffle, it could be considered a bit brash in terms of styling and better suited to tastes outside western Europe. But don’t let that distract from the fact that it’s an awful lot of loudspeaker for the money – too much to have been manufactured in France, of course, but that’s where it was engineered, and that’s what counts. ► wouldn’t have thought the 165mm mid driver would need it, but that is where most of the action is so it probably doesn’t hurt. Both drivers are polypropylene designs and have an unusual corrugated trim beyond the suspension. This presumably is the source of the Facet name and is said to “reduce the baffle effect and limit diffractions”. The tweeter has the same facet surround and a short horn on the soft dome driver. The cabinet has a vinyl wrap behind the shiny baffle and curved corners for a contemporary feel. It comes with an optional fiat base to increase the footprint and comply with ‘topple test’ regulations but I’m surprised it needs one as the box is hardly skinny. Cable connections are via bi-wire terminals sensibly placed near the bottom at the back. “The compensation for this is good dynamics, a result of big drivers and good sensitivity. ► ‘Hey Now’ [Truth is a Beautiful Thing, Ministry of Sound] has plenty of low end on it and revealed that these speakers can keep things under control and push out a big image without too much trouble. The image while large when it’s called for has trouble escaping the boxes, it was always thus with big wooden cabinets of the relatively affordable variety, and while this doesn’t undermine enjoyability you do lose a bit of image precision. The compensation for this is good dynamics, a result of big drivers and good sensitivity. This means that the Elipsons can swing big changes in scale and power with ease. It’s a style that suits live recordings really nicely, Ryan Adams and the Cardinals [Live at Das Haus, archive.org] sound very much the part thanks to the low end prodigiousness and scale of image created. It sounds more like a live PA than usual, which given that it was recorded in the audience is probably right. Adams and his band clearly had a bit of a Grateful Dead thing going on, one because of the rambling nature of songs like ‘Magnolia Mountain’ and two in that they allowed fans to record the gigs. The results of both sounded excellent here. Patricia Barber’s ’Company’ [Modern Cool, Premonition] is always a little bass heavy and with this speaker got a little too overweight, so much so that I decided to try a leaner sounding speaker cable. Replacing the Townshend Fractal F1 with Chord Sarum T proved a good move, it tightened the bottom end and added some attack to the leading edges. This livened things up nicely, making the music quite a lot more engaging. The presentation was less relaxed but the overall balance better suited to a wide range of music styles. Yet it was still easy enough to drift away with laid back material. Detail levels were up slightly as well, this isn’t the most revealing of loudspeakers, but through the mid and treble at least it’s easy to hear what’s going on with a fair degree of clarity. I changed from the ATC P2 power amp to an integrated DM250 from Struss Audio of Poland, this tightened up the timing and increased resolution which indicates that this speaker is sensitive to the source and amplification. The grooves on the K&D Sessions [Kruder and Dorfmeister, K7!] 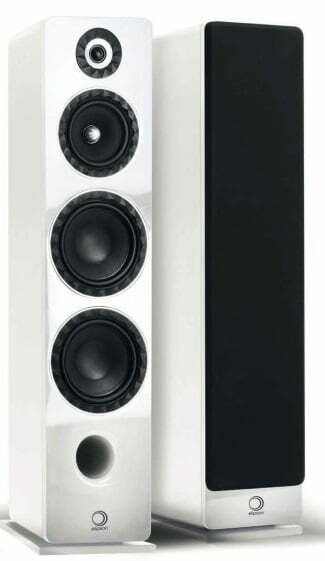 had plenty of detail and a juicy bottom end that inspired extended listening at highish levels. It also had me wondering how valve friendly the Elipsons might be. I only have a Quad VA-One to hand and that’s quite low powered with 12 Watts on hand for eight Ohm loads but it was worth a try. Or not: while it livened things up and brought out some of the energy in the music, there was clearly a shortfall that made for rather less than effortless listening. A bigger valve power amp might be an option, however, and glass audio enthusiasts could do worse than checking this speaker out.